B U B B L E G A R M: Origins Get Down Review! What it is: Deep pore clay cleanser. How often: 1 - 2 times a week. As a cleanser: Squeeze into palm and swirl onto dampened skin. Rinse. I adore the way my skin feels after I use this. It feels SO soft and clean and I can honestly say no other cleanser has made my skin feel this soft! It has a thick creamy texture with tiny beads in it to help exfoliate and deep clean pores. I use this once or twice a week, either to cleanse or as a mask. However, when I use it as a mask I leave it on for about 5-10 mins which I prefer. I also sometimes apply a pea sized amount onto an inflamed spot and leave it on for a few hours so that it dries it up, which works great! Please note: This will be to harsh to use on sensitive skin everyday. I've been looking for a good "scrub" and this makes me want to buy,lol!! Look like you have a great product there :) A good scrub is hard to find, most of them are to abrasive for skin. 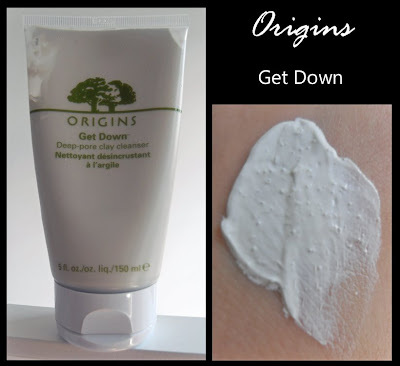 I love Origins skincare. This product is one I know want to try. Thanks!